Okay, so this isn’t actually a cookie recipe. Now that I look, I’ve only posted one real cookie recipe (those rosemary-lemon ones that you really should try despite the unusual ingredients). 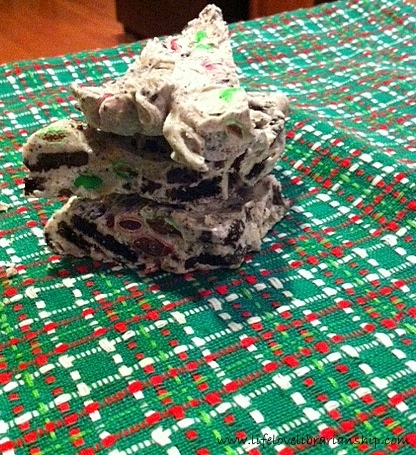 The rest have been bars, truffles, or brownies, and now this bark. Oops. But this should totally count as a cookie because it has the word “cookie” in the title. I have a hard time finding good recipes to share because I’m pretty picky about what I bake. I’ve already made all the classic Christmas cookies except for ones that have coffee, coconut, or any dried fruit other than cranberries or raisins because…ew. So that brings us here. Breaking up store-bought cookies, covering them in white chocolate, and calling it a day. A completely delicious, totally easy kind of day. If you need a simple recipe because you forgot about a party, need a quick sugar fix, or just aren’t very handy in the kitchen, I recommend this recipe. It’s a hit. I promise. Line a half sheet pan (or other large, rimmed cookie sheet) with waxed paper. Grease wax paper. Use your hands or a spoon to break up half the package of cookies in a large bowl. The cookies should be broken up but not crushed or smushed. 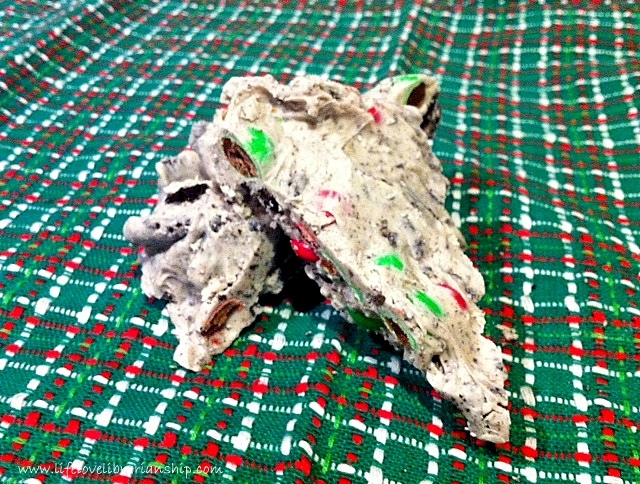 Melt 1 package almond bark or candy melts in a microwave-safe bowl according to the package instructions. When it’s melted and very smooth, quickly pour the melted chocolate over the cookie pieces and stir to thoroughly coat. Stir in 1/2 cup M&Ms and mix again. Spread the mixture out on the prepared pan, covering only half. Repeat the process using remaining cookies, almond bark, and M&Ms and cover the rest of the pan. Refrigerate for an hour, until the bark is solid. Break or cut the bark into pieces. Store at room temperature in an airtight container. Thanks so much for posting all of these great Christmas recipes. I made your Mostaccioli last night. Merry Christmas from this librarian in Washington state. This can also be packed and you can give it to your friends. I love the idea and I am sure everyone would love this. It is a great recipe and a good way to make your table look even more attractive for the holidays.